The Mackenzie King Estate was created by William Lyon Mackenzie King, Canada’s 10th prime minister. King led Canada from being a semi-colony of Great Britain to complete autonomy. 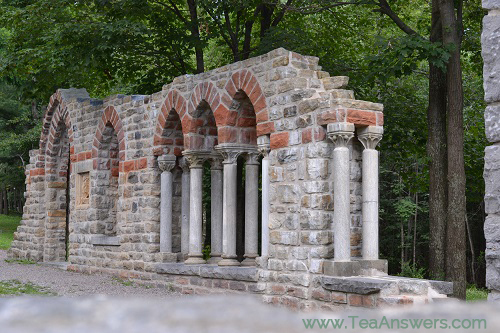 The Mackenzie King Estate consists of several cottages, trails, and ruins from Canada and abroad. It is located in the heart of Gatineau Park in Quebec. The grounds are absolutely beautiful. On the Mackenzie King Estate, you’ll also find the Mackenzie King Tearoom located in one of the former prime minister’s cottages. It offers teas and light meals. The Mackenzie King Tearoom is open daily from early May to mid-October. Prices do tend to run a little high given its lack of competition. A simple cucumber sandwich costs $14. The tea and coffee are all organic and fair-trade. I visited the tea room after touring the grounds. The day was absolutely beautiful, allowing my family and I to enjoy the outdoor seating. I highly recommend you do the same if the weather allows. The view from the porch is very romantic, with beautiful views of the grounds. It was before 2pm, so high tea wasn’t available. We opted for a pot of the Mackenzie King blend – a combination of English Breakfast, Darjeeling, Early Grey, and Buckingham Palace teas. The flavor of English Breakfast really stands out the strongest, with nice complimentary tones from the other teas. It’s absolutely delicious with and without milk. Unfortunately, the Mackenzie King Tearoom doesn’t offer any tea for sale to take home and savor later. It’s a real shame because the tea is really that good. It’s led me to create my own version of the Mackenzie King blend. Bring 8 oz. water per person to boil. Add all ingredients to your warmed teapot. Add water and let steep 3-5 minutes.